“Smiling is such a magical way of healing,” says Nozomi Terao, founder and Executive Director of HappyDoll, a non-profit organization that celebrated its first anniversary on January 11 of this year. Dedicated to connecting children around the world, HappyDoll saw hundreds of smiles in 2011. A small organization with only two staff members – Terao and marketing associate Nao Mizuno – HappyDoll brings volunteers and other non-profits together to make dolls for children in need. The organization collaborated with clinical psychologist Dr. Judy Kuriansky and her Global Kids Connect to deliver dolls to children in earthquake-stricken Haiti. Terao took handmade dolls to Japan last May, two months after the horrific earthquake triggered a devastating tsunami. In association with Students Helping Honduras, HappyDoll creations made Honduran orphans feel special. In 2011 HappyDoll also teamed up with Candlelighters NYC and the Association for Metroarea Autistic Children to bring smiles to the faces of childhood cancer patients and children with autism. They visited the Korean American Family Service Center’s Hodori afterschool program in Queens during Domestic Violence Awareness Month. In all, 550 HappyDolls traveled to children in need in the non-profit’s first year. The “need” isn’t limited to natural disasters or diseases; recipients of the dolls can be anywhere in any circumstance, be it physical or emotional. “My passion is to connect children no matter where they are,” says Terao. The concept is simple. 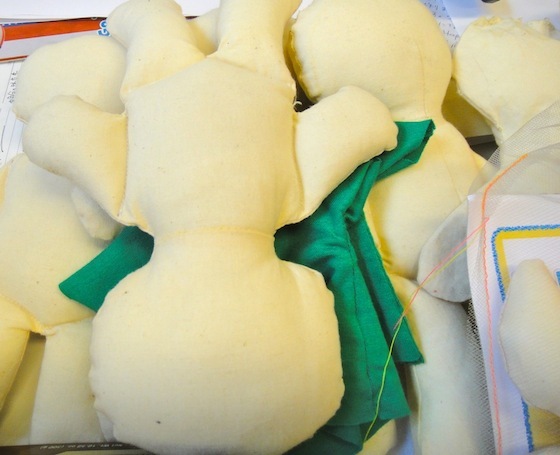 Schools, organizations, and individuals purchase HappyDoll kits, which include a plain, white doll – made by the hands of volunteers – and five non-toxic markers at a cost of $25 per kit. (HappyDoll covers the cost of special-needs schools and organizations.) Children use their creativity to color the dolls and write messages of hope. Their finished products are delivered to children in need. 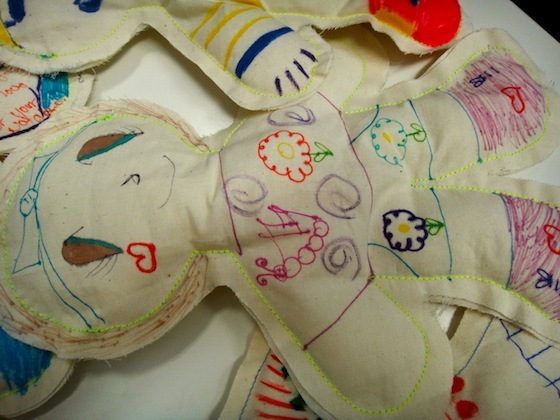 In an interesting twist, the children who are recipients of HappyDolls become makers of HappyDolls. For every decorated doll that Terao and volunteers – who are called “HappyDoll Ambassadors” – take to children, they also take plain dolls for those children to decorate. Their dolls are then sent to other needy children, creating a cycle of giving and sharing. The dolls are tracked so that each child will know where in the world his or her special gift traveled, becoming a pen pal of sorts. Terao wants the doll-making sessions to boost children’s creativity and imagination and to arouse their curiosity about where their dolls will eventually go. Children learn about other places in the world and to accept the differences of other cultures, which Terao learned to do at a young age. While Terao was growing up in Japan, her family was close to an American family. As a result, she became fascinated with Western culture, and that eventually led to her coming to the States at age 17. It’s important for Terao to reach not only children in need, but also children who are from financially secure families. Doll-making sessions at birthday parties teach them that the world is a big place and that not everyone is as fortunate as they are. Buoyed by the strength of their first year, Terao and Mizuno strive to expand the reach of HappyDoll. On March 11 – the one-year anniversary of the earthquake/tsunami/nuclear crisis in Northeastern Japan – they are having a doll-making session in conjunction with an open house at Japan Society. They recently formed a partnership with a school in Harlem to have ongoing programs with the students there. In addition, Terao and Mizuno are writing grants and seeking corporate sponsorship. HappyDoll is creating a worldwide community with each doll and with each collaborative effort. Terao’s dream is for every child in the world who has a special need to have a HappyDoll of his or her own, a doll made by a new friend from a faraway place who cares enough to share a magically healing smile. If you’re interested in participating, visit HappyDoll.org. Previous Previous post: The Tattoos and "Noh-oir" of Eric Schorr's "Tokio Confidential"